The book is a work of fiction about a financial utopia called Consensusland that uses the Connie – a bizarre digital currency that is not controlled by any bank, person, or government. The book includes examples of actual cryptocurrency projects that already exist, providing the public with a better understanding of the promise and problems of cryptocurrency. “With a concept like cryptocurrency – novel technology that’s very different than anything else we’ve ever used to do business with each other – I felt somebody needed to make this technology feel real, to put it into a real-life environment so everybody can see how it changes the way people think and interact,” said Helfman. 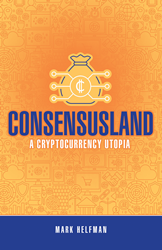 “Consensusland” presents a fictionalized account of how a society would function with the full implementation of cryptocurrency. This includes how it would change the way people think and interact and how governments and businesses function. Mark Helfman is a Quora top-5 writer worldwide for cryptocurrency and bitcoin topics. After graduating from University of Delaware, he worked on Capitol Hill for several members of Congress, including Nancy Pelosi. Helfman later worked in H&R Block’s government relations department and has consulted for several technology entrepreneurs. In 2017, he discovered cryptocurrencies, uses them regularly, and enjoys learning about new blockchain projects. To learn more, please visit http://www.consensuslandbook.com.